Birmingham Superprix - Britain's most controversial circuit? A droning noise could be heard coming from the Queensway tunnel. It was rapidly reaching an almost bearable pitch. Suddenly bursting into the bright sunlight appeared a scarlet Ferrari driven by the ex-World Motor Cycle champion John Surtees. He was closely followed by Graham Hill in his all British-made BRM and in third place, trying hard to overtake, came Jack Brabham. Brabham needed to win this race to clinch the Championship for a record third time and also to experience the unique achievement of winning the driver’s World Championship, at the wheel of a car bearing his own name. When Surtees found trouble changing gear both Hill and Brabham seized the opportunity to pass the stricken Ferrari and as all three drivers changed down through the gears to brake hard at the approach of the left hand Smallbrook bend, the roar of the engines echoed off the surrounding buildings. With a last-ditch attempt Brabham managed to get the inside line at the bend but Hill, determined not to give way, did his best to close the gap causing his rear wheel to touch the front wheel of Brabham’s car. The excited spectators gasped as both cars slid towards the barrier, but their skilful drivers kept control and accelerated hard along the Albany straight towards the finishing line. The crowd was left with the view of the Birmingham skyline shimmering through the lingering, sweet smelling haze from the racing cars’ exhausts. The scene could almost be from the Monaco Grand Prix, but alas is only a dream. A dream shared by many motor enthusiasts in 1966 when the idea of a Birmingham Grand Prix was inspired by the opening of the newly built inner Ring Road and Queensway tunnel. This story is about such a dream, which after a nineteen-year struggle with many setbacks and successes almost became a reality. The result was not a Grand Prix but the Birmingham Superprix. It is interesting to note that the confrontation between Hill and Brabham did eventually take place on the streets of Birmingham. Some twenty-three years later, in 1989, Damon and Gary, sons of Graham Hill and Jack Brabham, competed for places on the starting grid for the F3000 race at the Birmingham Superprix. My aim for this website is to prove you as much information as possible regarding about the Birmingham Superprix. When I first discovered about the Birmingham Superprix back in 2003 I was amazed that there was a lack of information and media available about this unique British circuit. So I set out to collect much information as possible from the internet and other sources such as the Birmingham Central Library, drivers who raced around the street circuit or even on the eBay auction website as there were a lot of rare items related to the Birmingham Superprix available to bid for. 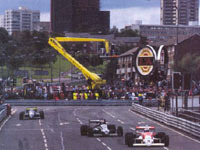 2003 - Resurrection of the Birmingham Superprix?